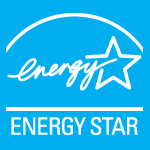 We offer a number of ways to reduce your energy bill. Some can be done for a small investment, others a larger investment, all with a corresponding return on investment. What type of space do you need to heat and / or cool? Which energy source do you want to use to heat your home? What type of system would you like in your home? 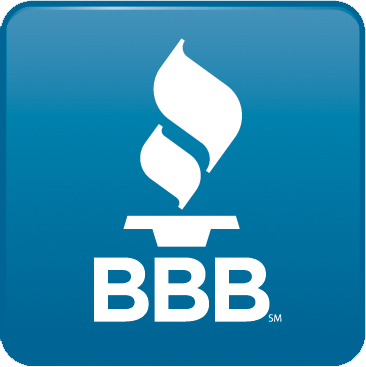 To help us with your evaluation, we need to know what type of system you have in your home. Review the system types below, and chose the one that best represents the system you have in your home. Click on any image for more details about that system type. All you need is a control or thermostat and any air quality accessories you'd like. Packaged Systems may be located on the exterior of your home either on the rooftop or in the yard. 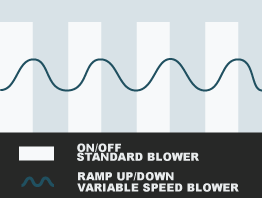 Are you interested in a variable speed system? 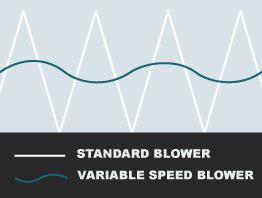 Systems with variable speed blower motors have significant advantages over single speed systems. What level of system efficiency are you interested in? Please select the system type above before answering this question. 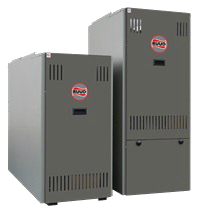 The Ruud High-Efficiency RHMV Air Handler to deliver energy efficient comfort to your home. 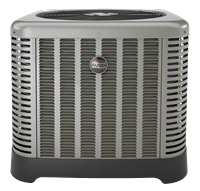 The unit is designed to help save you money on utility bills while quietly enhancing indoor air conditions. Versatile 4-way convertible design for upflow, downflow, horizontal left and horizontal right applications. The EcoNet Smart Home System provides advanced air & water control for maximum energy savings and ideal comfort. Depend on the Ruud EcoNet™ Enabled High-Efficiency Two-Stage RH2T Air Handler to deliver energy-efficient comfort to your home. The unit is designed to help save you money on utility bills while quietly enhancing indoor air conditions. 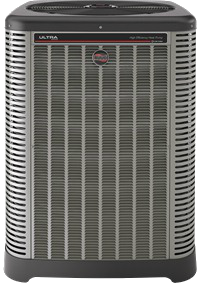 The EcoNet™ Enabled*, inverter-driven Ruud Achiever Plus™ Series Three-Stage Heat Pump offers the solid technology and energy-saving performance you've come to expect from Ruud. Equipped with electronic expansion valve to precisely control variable refrigerant flow. Depend on the Ruud High-Efficiency RH2V Air Handler to deliver energy efficient comfort to your home. The unit is designed to help save you money on utility bills while quietly enhancing indoor air conditions. Evaporator coil is constructed of aluminum fins bonded to internally grooved aluminum tubing. Depend on the Ruud High-Efficiency RH1V Air Handler to deliver energy efficient comfort to your home. The unit is designed to help save you money on utility bills while quietly enhancing indoor air conditions. Diagnostic service window with two-fastener opening - provides access to the high and low pressure. Fan motor harness with extra long wires allows unit top to be removed without disconnecting fan wire. 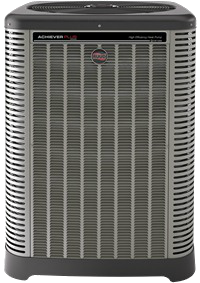 The EcoNet™ Enabled Ruud Achiever Plus™ Series Two-Stage Air Conditioner offers the solid technology and energy-saving performance you've come to expect from Ruud-brand products. High and low pressure standard on all models. The Ruud Achiever® Series Air Conditioner offers the solid technology and energy-saving performance you've come to expect from Ruud-brand products. It's also quiet, so you won't give your indoor comfort a second thought. RQRM Dedicated Horizontal Package Heat Pump units feature earth-friendly R-410A refrigerant. This platform provides you with a full line of capacities that are each AHRI-certified. Durable Cabinet with Louvered Condenser Compartment. Our mount helps protect the fan motor from the elements for longer life. Operational controls are "up front" for quick installation and easy service diagnostics. Exterior service fittings enable a serviceman to quickly determine unit operating conditions. 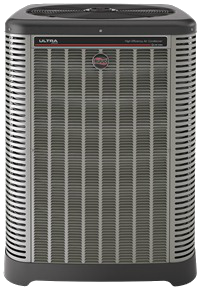 The 2-4 ton Ruud 13 SEER RQNL & 14 SEER RQPL, Package Heat Pump units feature earth-friendly R-410A refrigerant. This platform provides you with a full line of capacities that are each AHRI-certified. All units feature an internal trap on the condensate line eliminating the need for installing an on-site external trap. Rugged base rails included for improved installation and handling. The 2-5 ton Ruud 13 SEER RSNM & 14 SEER RSPM, Dedicated Horizontal Package Air Conditioning units feature earth-friendly R-410A refrigerant. This platform provides you with a full line of capacities that are each AHRI-certified. Rugged base rails are included for improved installation and handling. 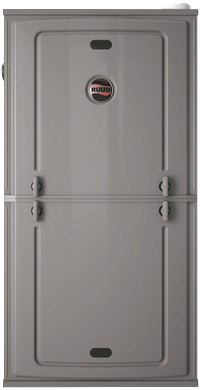 Industry-first patented features and 360?+1 engineering make the Ruud U97V Ultra Series Gas Furnace a smart option. From top to bottom, inside and out, and every angle in between, we've thought of everything to bring you efficient and reliable indoor comfort. Experience reliability for years to come while also saving money and energy with the EcoNet™ Enabled Ruud U96V Ultra™ Series Gas Furnace. This high-efficiency, ENERGY STAR® qualified series is engineered so that you don't have to think about being comfortable in your home. 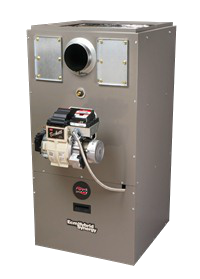 The Ruud Ultra Series™ 90 Plus Modulating Gas Furnace equipped with the Comfort Control 2 System™ is a highly sophisticated heating product. 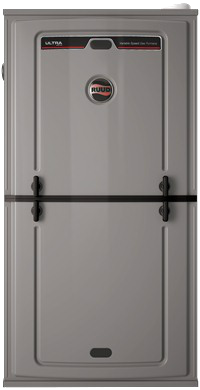 Pre-paint galvanized steel cabinets for added reliability & durability. 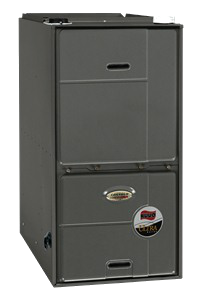 Industry-first patented features and 360?+1 engineering make the Ruud R92P Achiever® Series Gas Furnace a smart option. From top to bottom, inside and out, and every angle in between, we've thought of everything to bring you efficient and reliable indoor comfort. 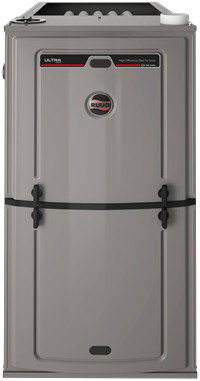 Ruud Ultra™ Series Package Gas Electric units are engineered to provide your family with durable performance for years to come, while keeping your utility bills low. It's definitely a package that keeps up - for comfort that keeps on winning. One-piece top with a deep flange to help keep water out of the unit. Supply and return air openings feature a one-inch tall flange to prevent water migration into the ductwork. Complete factory charged, wired and run tested. Ruud Oil Furnaces exceed standard efficiency levels by obtaining AFUE (Annual Fuel Utilization Efficiency) Ratings up to 85.9%. For energy conservation and clean air. Ruud Oil Furnace has combined quiet operation and multiple motor options for maximized comfort. 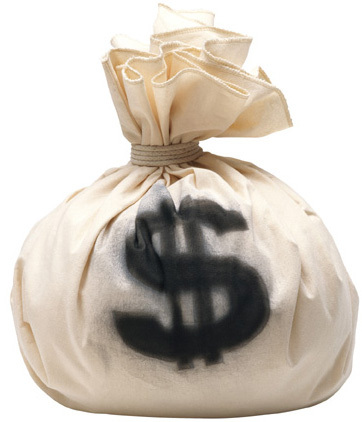 The average homeowner spends about $1,900 annually on energy bills. Heating and cooling accounts for as much as half of a home's energy use. 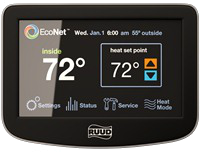 The Ruud EcoNet™ Control Center, our intuitive, integrated air and water management system, customizes comfort while cutting energy costs*--from anywhere. 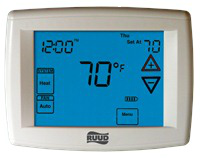 Ruud 500-Series thermostats are part of the Ruud Comfort Control2™ System where the thermostat auto configures the system and constantly communicates with the indoor and outdoor heating and cooling components to provide the homeowner with the utmost in home comfort and peace of mind. 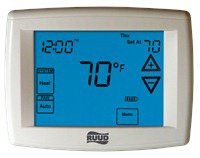 The Ruud 400-Series touchscreen dual fuel control is designed for maximum comfort and energy savings with dual fuel split systems or package dual fuel models and dual fuel system puts the control back in your hands while you set your level of comfort. Ruud has set a new industry benchmark with the 300-Series blue touchscreen with advanced technology not only delivers all the best features, it's truly universal. Plus, it's designed to be easy-to-view, easy-to-understand and easy-to-operate with simple on screen programming. When can we contact you? Any other concerns / interests?